The Muppets kicked off their three-night live residency at the Hollywood Bowl last night, playing a number of their most beloved musical hits for an audience of loudly cheering fans. Unsurprisingly, the set list included a rendition of “Rainbow Connection,” Kermit The Frog’s most iconic tune (and presumably a pretty intimidating gig for performer Matt Vogel, who took over the part just a few weeks ago). Now, you can evaluate Vogel’s performance for yourself, because footage of the big musical number has surfaced online. This rendition of “Connection” features not just Kermit, but also the rest of the Muppet crew, along with original songwriter Paul Williams. (Plus Bobby Moynihan, sticking around after appearing on an earlier song.) And sure, we’ve heard “Rainbow Connection” a lot of times over the years—and Vogel’s vocal’s can’t quite match the warmth with which Jim Henson filled the song so many years ago— but it’s also not like we’re not going to cry a little bit when we see Kermit and his friends playing it on a stage for a bunch of happy watchers. 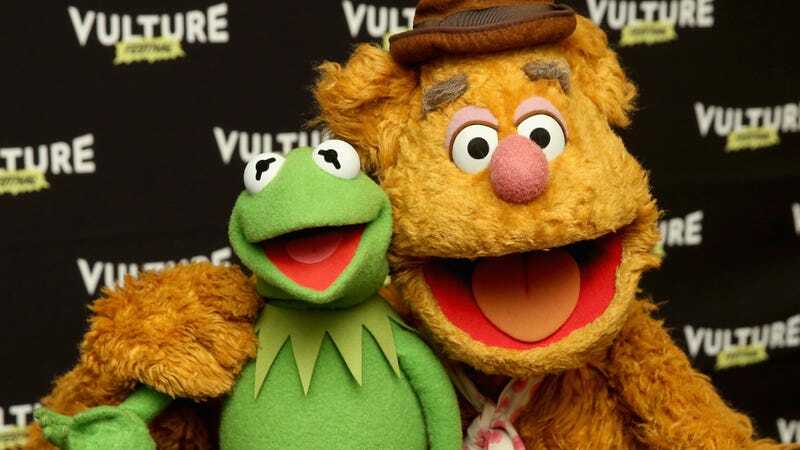 The Muppets will return to the Bowl tonight and tomorrow, putting together a live show that mixes a variety of songs with updates of classic Muppet Show sketches.